The mycochitin composition of mushroom cell walls is difficult for humans to digest until heated. Health benefits are released by heat tempering which makes beneficial compounds available to be absorbed by the body. Some species like oyster mushrooms contain ostreolysin which require 140F to neutralize. 2 tablespoons chicken bouillon granules. Chips, crackers or fresh round slices of cucumber. 1. Sauté mushrooms in a large frying pan on medium-high heat with 6 tablespoons of butter and lemon juice until soft. 2. Simmer for 5 to 10 minutes. 3. Add onion, sour cream, bouillon granules and salt and pepper and simmer for 5 to 10 minutes more. 5. Add the paste to the hot mixture and stir until thickened. 6. Serve in hot serving plate with chips, crackers or fresh vegetables. 2 pounds of asparagus with 1/2 of root end sliced off. sea salt and pepper to taste. 1. Melt butter in a large saucepan over medium heat. Add the onions and mushrooms and sauté over medium-high heat for approximately 3-4 minutes. 2. Add chicken broth and the whole asparagus spears. Bring to a boil and simmer until asparagus is tender but not limp. Set aside the tips of 8-10 of the spears. Simmer until asparagus is very tender. 3. Transfer the broth and asparagus to a blender. Add the milk and salsa. Puree. 4. Return soup to pan and cook over medium heat until steaming hot. Add salt and pepper to taste. 5. Serve into 4 bowls and sprinkle with cheeze and garnish with the reserved aparagus tips. 1 pound green beans, sliced into 3 inch pieces. 1. Combine vinegar, oil, scallions, mustard, dill, salt and pepper in a jar and shake well to blend. 2. Put mushrooms in boiling water and cook 3-4 minutes. Remove mushrooms from water, transfer to a bowl, and pour dressing over them. 3. Put green beans in boiling water and cook until barely tender, approximately 8 minutes. Cool beans quickly by plunging them into ice water. 4. Add green beans to mushrooms. Add sour cream and mix thoroughly. Chill 2-4 hours. 5. Remove salad from refrigerator about 20 minutes before serving. Add additional seasoning if needed, and garnish with cherry tomatoes and bacon bits. Contain almost no fat and sodium. The amino acid count in mushrooms is higher per serving than corn, peanuts, and kidney and soy beans. The vitamin content of mushrooms is actually similar to the vitamin content found in meat. Potassium: good for the heart, reduces the risk of high blood pressure and strokes. A Portabella usually has more than a banana. Copper: aids iron (also found in mushrooms) in making red blood cells and delivers oxygen to the body. Selenium: together with Vitamin E it produces antioxidants that neutralize "free radicals" which can cause cell damage. Riboflavin for healthy skin and vision. Niacin aids the digestive and nervous systems. Pantothenic acid helps with the nervous system and hormone production. Mushrooms have been used medicinally in China for more than 6,000 years. Gourmet mushrooms have antibacterial, anti-candida, anti-inflammatory, antioxidant, antitumor, and antiviral properties. Mushrooms also reduce blood pressure, moderate blood sugar, reduce cholesterol, enhance the immune system, and reduce stress. They are a kidney, liver, and nerve tonic. For 30 years, researchers have studied mushrooms' effectiveness against cancer. They found that mushrooms fight the following cancers: breast, cervical, uterine, colorectal, stomach, leukemia, liver, lung, lymphoma, melanoma, ovarian, pancreatic, prostrate, and sarcoma. Mushrooms are comprised of 85-95 % water. Mushrooms have their own immune system. Mushrooms are more closely related in DNA to humans than to plants. Most plants have a mycorrhizal relationship with fungus. The roots of the plants have a symbiotic relationship with the underground mycelium. Mycelium nourishes the plant's roots, and in trade, the plant transfers nutrients to the mycelium. The antibiotic penicillin was derived from the fungal species Penicillium. Some mushroom spores can dry and stay dormant for a century. Like human skin, mushrooms can produce vitamin D by being exposed to sunlight. In fact, exposing a freshly cut shiitake mushroom, gills up, to the sun for eight hours can increase its vitamin D content by as much as 4,600 times! The Honey Mushroom (Armillaria ostoyae) is the world's largest known organism. This massive organism covers 2,384 acres (nearly four square miles) of soil in Oregon's Blue Mountains. The fungus is estimated to be 2,400 years old but could be as ancient as 8,650 years. Mycelium can use toxic substances such as oil, diesel and even e coli bacteria as a food source converting it into ... well ... mushrooms. Some mushrooms actually glow in the dark using a process called bioluminescence. In the past, people illuminated their way through the woods using these glowing pieces of fungus-colonized wood. Fungi produce antibiotics to fight off other microorganisms. Mushrooms have recently be discovered to use radiactivity as energy to make food and researchers are considering it for growing in long term space missions to convert cosmic radiation into food. Mushrooms added to bandages are showing amazing promise in accelerating healing. Top Shelf Mushrooms grow-at-home Oyster Mushroom kits will produce mushrooms that can double in size in 1 day. Top Shelf Mushrooms handles every stage of mushroom production. We employ sustainable growing methods, green technology, local organic ingredients and daily attention to quality. To ensure top quality, we use our own pure cultures, make our own spawn (seed) and do our own harvesting, packaging and delivery. Our innovative growing system combines a computer-controlled environment, filtered air and Blue Mountain spring water for a truly superior product. We harvest mushrooms every day...so fresh is 100%guaranteed! Top Shelf Mushrooms are grown by hands you know. Request a free sample of our mushrooms. Our product speaks for itself. * Availability may vary due to season and demand, please ask. Odin's purpose is to speed up production ensuring control of mixture and moisture. It allows you to easily change recipes in seconds in a digital menu and eliminate waste by only making exactly as many bags as you need. Brad has been using Odin exclusively on the farm for over a year now running thousands of bags and all types of media through it and in the process has made numerous improvements. New industrial stand is fantastic. It will collapse for shipping and be super simple to unbox and setup. New options emerging for make your own hoppers or buy our nested powder coated steel hoppers. Optional liquid dosing seems like an option people will want for various reasons. PCBs had 1 flaw, new displays work well and allow for more information during production. Will be ordering new PCBs with corrections and optimized size in mid/late January which are hopefully final versions. Functional prototype has stable code for new combination pellets and independent threaded processes for each bagger. Brad will be soldering up the new PCB boards but is waiting on a few parts to make Odin modular and massive reduction in wiring. Feb-March, 2019 - Release to selected early test users to gather feedback to implement improvements. June 2019 - Official release. Not specified at this time unfortunately. Contact Brad for more information. Odin will cost between $2000 and $4000 depending on options. Currently only considering releasing an assembled and tested unit. It will require some re-assembly. Electrical Notes: Water and electricity don't mix well. I've made the whole system 12VDC. Also, UL and CSA electrical standards require anything with a plug but tested and approved but a 12VDC system does not require this, so it will be sold as a "kit" where you supply the power supply and wire up 12 volts from a transformer, car battery or even a solar panel. After your kits have finished producing mushrooms, people often ask us: "What do we do with it?" The answer depends on which kit you have enjoyed. As with all outdoor culture, be sure the mushrooms you pick are the same you already harvested indoors as sometimes dangerous other species can invade. You can add one of our Elm kits to your garden to actually boost the growth of your vegetables. A symbiosis is created with this species of mushroom between the mycelium and plant roots which can give you a dramatic increase in your vegetable yield. With the right conditions the mycelium from your kit will expand into straw and you'll enjoy additional outdoor crops later that year and/or in a following season. The kit adds mycorrhizae into your soil. Instructions: We recommend you use one 5 pound Elm kit for about 15-20 pounds of straw (dry weight). This results in a spawning ratio of about 20-25%. Spread the straw out in a thin layer around your garden's plants or where you plan to plant your vegetables. Break up the Elm kit into crumbled chunks and spread them in clumps or like islands instead of being completely evenly spread. Then cover with more straw to retain moisture and create a sort of mycelium sandwich. Wet the bed with non-chlorinated water and engage in benign neglect (forgetaboutit). In 4-6 weeks you can peel back some of the straw to see if the mycelium took hold and expanded. 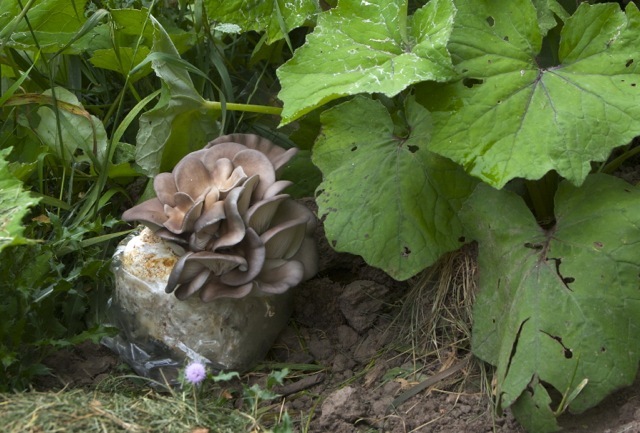 Oyster mushrooms are aggressive species and can be encouraged to proliferate outdoors producing even more yield. When the weather is not too hot or dry you can spread the mycelium of your finished oyster kit in wood chip piles, under log rounds, between scarred logs or even between layers of straw. We have a pile of wood pellets placed near a downspout from our eaves trough. The abundant water after a rain soaks one end of the wood pellet bed however the mycelium absorbs and transports moisture to the colonies that have been established from our expired kits. Where our finished kits go to their final resting place ... or not! You can also simply place your expired kit outdoors in a shady area leaving the bag still on it but cut the whole top off so the top face of the block is exposed. This provides some protection from insects, foreign competitors and traps in some moisture. Natural rain cycles or even morning dew can provide enough moisture to trigger bonus fruitings as this one expired blue kit shown above did. We have also had some similar experiences with shaded shiitake blocks that provide extra surprises long after you thought all hope of another flush was lost.